The law of averages suggests that the more jokes a comedy makes, the fewer laughs each individual goof will get. Netflix’s new Australian import Pacific Heat manages to apply a sort of comedic theory of relativity to that premise, delivering what feels like an infinite number of gags in its interminable 22-minute run time, and somehow managing to not let a single one of them be good. The show’s characters all have names, but they don’t matter, any more than its bare-bones plots. There’s Dumb Guy (co-writer Rob Sitch), Dumber Guy (Cilauro), Ditzy Girl (Lucia Mastrantone), and that old comedy stand-by, The Nag (Rebecca Massey). Together, they sleepwalk through long, meandering conversations and the occasional explosion, never letting enough air slip into the dialogue for anyone to breathe. Sitch is burdened with the hardest job of all as the show’s main character, Todd, attempting to wring some kind of comedy out of a dim-witted sociopath with a tendency to run every joke so thoroughly into the ground that they wind up emerging in Duluth. Sitch has been funny in other things. He’s the creator of the Aussie sitcom Utopia—not to be confused with the cultishly adored British sci-fi series of the same name, or the short-lived Fox reality series—where his character had a point of view and intelligence that are entirely absent here. There’s nothing inherently wrong with amoral characters in a comedy—the aforementioned folks at FX have managed to build an entire brand out of them—but Pacific Heat’s bland ciphers have no definable traits, only a willingness to queue up for the next rapid-fire quip. And maybe it’s some quirk of the audio engineering, or the Australian accents, but it feels like every line is dryly mumbled by a cast that can only barely keep itself awake. Have we mentioned that it’s ugly, too? The animation is stiff, the action scenes are listless, and every character looks like they were drawn by someone whose only reference to human anatomy was one of those old How To Draw Manga Characters books. That doesn’t stop the plots—a drug deal in the first episode reviewed, and a terrorist caper in the second—from finding excuses to strip the female characters to their underwear, to ostensibly titillating effect. Outside of confused Archer fans, or adult-oriented cartoon aficionados who’ve already burned their way through BoJack Horseman, F Is For Family, Family Guy, Futurama, American Dad, South Park, Brickleberry—yes, Brickleberry—and all 600 extant episodes of The Simpsons, it’s impossible to figure out who Netflix acquired this series for. It’s visually unpleasant. The jokes make up in repetition what they lack in elegance or wit. And the dialogue doesn’t just flirt with racism: Occasionally, it takes racism to bed and makes sweet, discomfiting love to it. 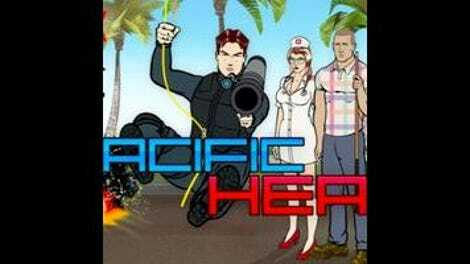 Pacific Heat is a bad show, but a worse comedy. In 44 minutes—and roughly 200 or so jokes—it didn’t elicit a single laugh. Find something else to watch—it’s not like Pacific Heat is hurting for companions in Netflix’s “Adult Animated TV Comedies” category.